Actress, entrepreneur and author Victoria Principal is joining Americans across the nation in support of American Humane Association's lifesaving work to rescue and shelter animals caught in the path of the devastating Oklahoma tornado last week. Principal, a longtime supporter of American Humane Association, is urging people everywhere to help the charity’s famed Red Star Rescue team, which is on the ground outside Moore, Oklahoma conducting search, rescue and sheltering operations – and reuniting pets with their families. American Humane Association’s Red Star team moved quickly to intervene in this disaster, which cut a deadly swath 17 miles long through the heart of Oklahoma and affected thousands of people and animals. 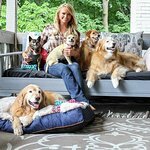 The tornado occurred Monday and by late Tuesday, with the help of country singer Miranda Lambert's MuttNation Foundation, Red Star was invited by the State of Oklahoma to deploy as an approved responder to assist Moore’s animal victims. Within hours they put their teams in motion, covering more than 2,000 combined miles in just over a day heading to the disaster scene with staff and volunteers, their 82-foot Rescue Rig with its emergency equipment, quarters for 12 volunteers, and mobile operating theater sponsored by Mars Petcare US, and their 50-foot Lois Pope LIFE Rescue Vehicle. Principal joins a growing number of people and organizations generously supporting the Red Star effort. Americans across the country sent in donations to help. Mars Petcare US, makers of PEDIGREE Food for Dogs and WHISKAS Food for Cats, is sponsoring the deployment of the giant Rescue Rig and donating emergency food supplies. Banfield Pet Hospital, a business of Mars, Incorporated, is supplying veterinary care, along with Zoetis, which is supplying vitally needed medicines. Philanthropist Lois Pope, country music star Miranda Lambert ‘s MuttNation Foundation and American Humane Association supporters across the country who sent in donations for the relief effort are also supporting this effort. Logistics are being provided by Rescue Bank, Mars Petcare’s partner for donation shipment. Rescue Bank manages a nationwide network of non-profit distribution centers delivering donated pet food to rescues, shelters and social service agencies. And PetSmart and Code 3 Associates provided much-needed extra crates. American Humane Association’s Red Star Rescue teams have been part of every major disaster relief effort for the past century from rescuing horses on the battlefields of World I Europe to Pearl Harbor, 9/11 and last year’s Hurricane Sandy. They have rescued and sheltered more than 70,000 animals in just the past five years.